Hamsters by nature are very active animals and most of my life spent on the move. But this is only possible in natural conditions. In the house of the rodents all the time spend in the cage. A sedentary lifestyle can negatively affect their health, therefore in the home hamsters just need to set the wheel on which the animals are to realize their needs. This exercise equipment you can buy, but you can do with your hands. And what should be the correct wheel? The mechanism of the device should be reliable and safe, and the wheel itself must be securely fastened inside the cell. The rotation of the wheel should be absolutely free. If your pet will have to work harder during a workout, he soon abandoned this occupation. Run for the animal should be easy to bring the fun. The rotation should be possible in silent mode. This parameter is more important for the owner. Hamsters are active at night. It is unlikely you will be able to sleep peacefully under grohotali plastic or metal things. In-store purchase toys will cost from 150 to 1500 rubles – you can choose for every taste and budget. But if you have some free time and a pair of skilled hands, it is possible to manufacture the projectile with their hands. Living in the house the children are happy to take part in the creative process, are they only offer. 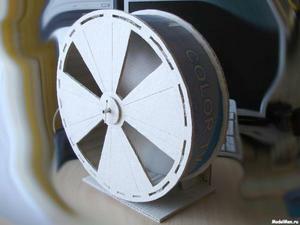 So, what and how to make a hamster wheel with your hands? To produce a wheel of this material is absolutely not difficult, it may not last for long, but for some time it will be enough. The workflow itself even for a younger student. First you need to make blanks. 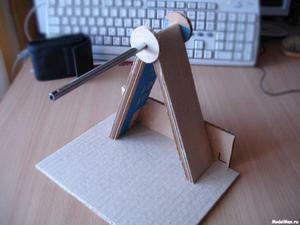 On cardboard with pencil, draw 2 circles of the required diameter, then cut them out with scissors. One of the details make a slit through which the hamster will climb into the sports equipment. After that first draw , and then cut along the edge of the circle with a rectangular hole at a distance of 5 mm from the edge. Now start making the track. It is cut from a strip of cardboard the desired width, leaving the edges of the tabs to the quadrangle of the slots on the circles. Then cut the base and the wall to which will be attached to the simulator. During Assembly of the track protrusions inserted into the grooves in the circles. Then fasten together the base and the wall. In the center of the wall drill a hole for the metal sleeve and set the item in the resulting hole. Thereafter, the sleeve is put on the wheel and fixed at the ends of the plugs so that the design has not collapsed. The build process is finished. Hopefully, the hamster will scrunch his toys into small pieces not so fast. Hamster wheel with their hands can do with an old Winchester and tin cans.This version is much stronger, but also more time-consuming. Self-made simulator also will need tin snips, a screwdriver and a marker. It is first necessary to release the spindle, which on the box hard drive to spin screws and remove the cover. The spindle inside the box in appearance similar to bearing, but it is a slightly different mechanism. He will need to rotate the wheel Assembly. You then need to do a tin jar. From it on a circle cut out metal circle, retreating from the bottom approximately 5 cm for small hamsters and 7 cm for the larger.To cut the line is smooth, it is best to outline with a marker. Then to the bottom of the workpiece spindle is glued with superglue and wait until the compound dries. For interior banks cut strip of material. Ideal porous polystyrene, it absorbs noise and gives a rodent’s feet to slip off the surface. The width of the strips should be such as to leave allowances on the edges, as the cut banks turned out sharp. The fabric glued from the inside, and the edges wrapped up and fix a piece of masking tape. After that, all that’s left is to attach the facility wire to the cage . 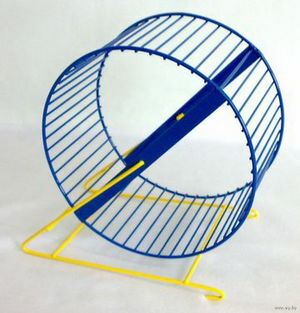 The wheel is mounted in a cage and is there permanently. If the house did not have such structures, a hamster may not immediately understand why it is needed and how to use it. Help him in this. Put the animal on the treadmill and a little scroll it. Can be put inside higher any treat. 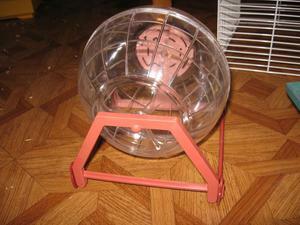 In an attempt to reach it, the hamster will bring the wheel in motion immediately and will know how to use it. Definitely need to wash the wheel 1 once in two weeks. In the cage must be kept clean, and that includes all accessories. If your pet is purchase a wheel that is beginning to creak, to fix the lack of it quite simply. Lubricate all fasteners of any vegetable oil and roll the wheel back and forth several times. If you have purchased suspension design wheels, hung on such a height that a pet could easily climb in and out back. As you can see, there is nothing difficult to do life home hamster more interesting and varied. In addition, regular Jogging will improve and his physical form.